Please also read our Education Documents and Terms and Conditions. What is the minimum number of students per session? 20 students for a Full Day Programme. 50 students for a Full Day Programme. How long do the education programmes last? Can my students have extra time to explore the exhibition after our session is complete? Yes, all groups are welcome to stay in the exhibition for as much additional time as they require after their session is complete. What are your adult:student ratios? What dates and times are available to complete an education visit? Education visits can be booked on Monday – Friday from 10:00am – 4:00pm. Time restrictions however apply for the ‘Emirates Cabin Crew: From Application to Employment Workshops’ and ‘Full Day Programmes’, see our Education Programmes for more details. Times and dates are subject to availability. To make an education booking, please fill in our on-line provisional booking form, email education@aviation-experience.com or speak to the education department directly on 0203 440 7022. How old do my students have to be to be able to use the Simulators? Simulator sessions are restricted to KS3, KS4, KS5 and Further Education groups. This is due to height restrictions and the complexity of the machines. Exceptions however can be made for some Year 5 and Year 6 and SEN students. 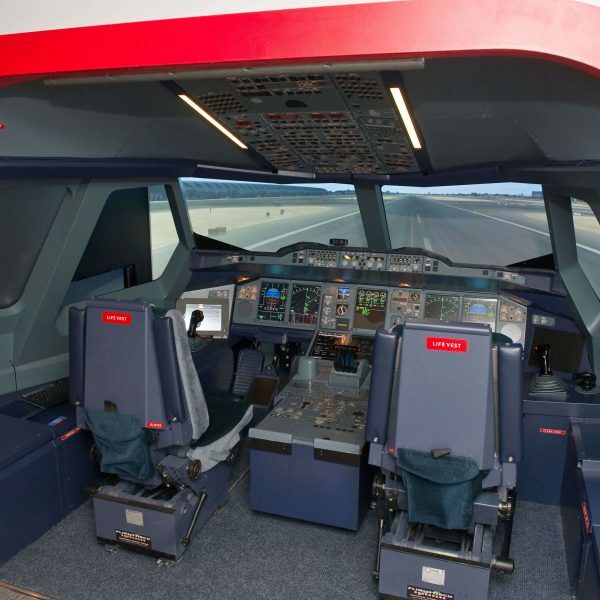 If you would like to discuss the use of our simulators, please contact our education department on 0203 440 7022 or email education@aviation-experience.com. When do I have to pay for my visit? All educational visits must be paid 14 days prior to the visit date. Our finance team will get in touch with the invoice and payment details once the booking is confirmed. Payments can be made by a BACS transfer, Credit/ Debit Card or by a cheque (Cheques should be drawn in favour of ‘Ekaleco Limited’). If you are booking within 14 days of your visit you must make an immediate payment via BACS. What do I do if I need to amend the number of students attending? Student numbers can be amended up to 21 days prior to the visit. Will I get a refund if I cancel or amend my booking? A refund will be available for bookings that have been cancelled up to 28 days or amended up to 21 days prior to the visit date. Refunds will not be available for bookings that have been cancelled within 28 days or amended within 21 days of the date of the visit. Where do I go when I arrive at the Emirates Aviation Experience? When you arrive for your visit, please head straight to our main entrance, where you will be greeted by a member of our staff and brought into the exhibition. What should I do if there is a problem on the date of my visit and my group is going to be late? Contact us as soon as possible and we will do everything we can to ensure that your group can still complete their entire education session with us. Visits times however may need to be reduced due to other education bookings. Please call 07795 554 965 if you are going to be late for your visit. What should I do if it is the date of my visit and my group is unable to attend? Contact us as soon as possible and we will do everything we can to re-arrange your session for another date. Your payment will not be refunded. Please call 07795 554 965 if you are unable to attend your visit. Is there a risk assessment available for me to access before my visit? Yes. A copy of our risk assessment is available for you to download from the Booking section of our website. A copy of our risk assessment will also be sent to you as part of your booking confirmation. Is your site accessible to wheelchair users? 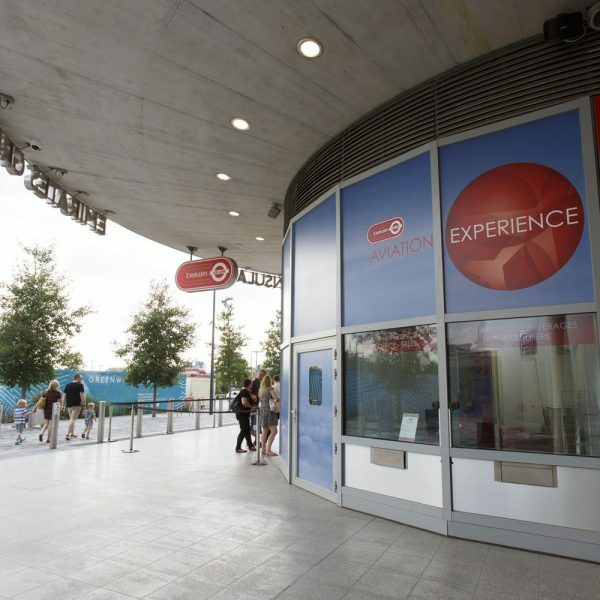 The Emirates Aviation Experience exhibition, cockpit, café and shop are accessible to wheelchair users. All Tours and Workshops can be completed by wheelchair users. A lift is available to take students to our mezzanine floor and an accessible toilet is available for use in our café. Unfortunately our simulators are currently not accessible to wheelchair users. 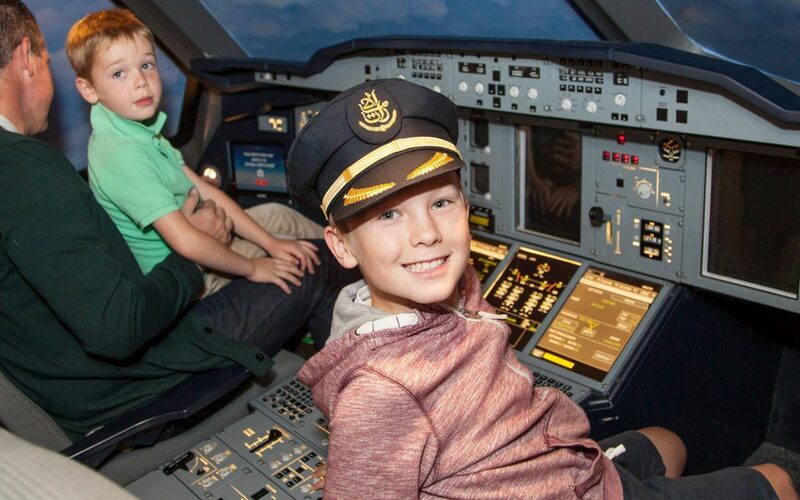 Do Emirates Air Line School Scheme tickets allow us access to the Emirates Aviation Experience? No they do not. We currently do not have a joint education tickets. Visits to the Emirates Aviation Experience must be organised and booked directly through us. Are there lunch facilities available for us to use? We currently have no inside lunch facilities available for groups who want to bring their own lunches. However our covered outside eating area is available for use on request. Our café is available for students and teachers who have per-ordered lunches through our lunch Education Booking Form. Should my students bring money with them to spend in the Emirates Aviation Experience gift shop? 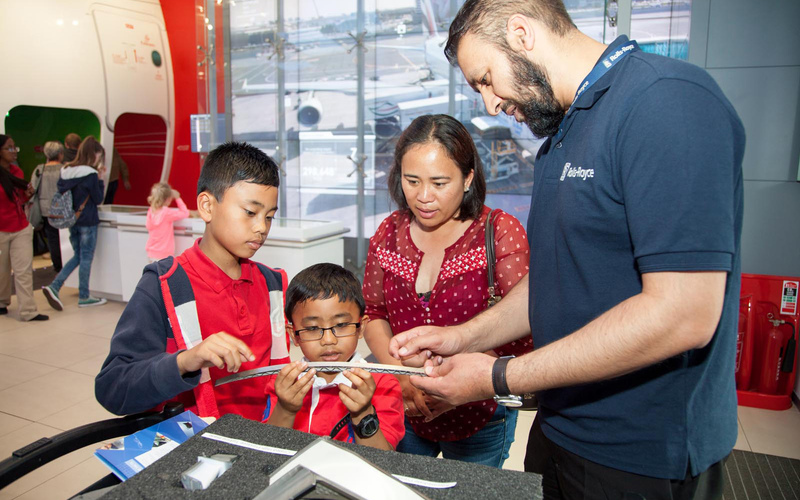 All groups can visit the Emirates Aviation Experience shop after their visit, which has a wide range of items which begin from 99p. Can I order items from the shop for my students? You can order our pre-made souvenir packs. Packs are priced at £3 and £5. For more information about our different packs or to order them, please visit our souvenir form (link to order form). All packs must be pre-ordered. Is there any parking near to the Emirates Aviation Experience? Yes there is. We are only a very short walk from a number of O2 car parks which are suitable for both cars, minibuses and coaches. Parking charges apply. Pre-booking discounts are available for blue badge holders. 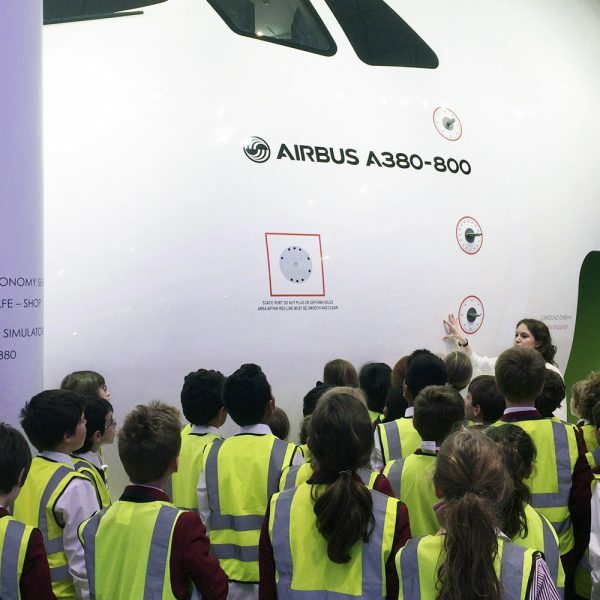 Is my school party eligible for free travel to the Emirates Aviation Experience? All schools within the Greater London area, with travelling student parties between the ages of 5 to 18, are able to take advantage of the Transport for London’s School Party Scheme. Visit www.tfl.gov.uk/schoolparty or call London Underground Customer Services on 0845 330 9881 for details and bookings. Where will our workshops be held? All workshops are held inside a replica A380 cockpit. Are worksheets available for us to use during our programmes? A worksheet is currently available for KS1 and KS2 students. All worksheets will be handed out during your visit. Are there any teacher’s resources that we can access to support your tours and workshops? Additional student and teacher resources, based on our education programmes, will be available from September 2016. To access our teacher’s resources, please visit our Teachers page. Are educators at the Emirates Aviation Experience DBS certified? Yes, all educators at the Emirates Aviation Experience are DBS certified. Is there a trained first aid staff member present at all times? Yes, we will always have a fully qualified first aid staff member available in the Emirates Aviation Experience at all times. 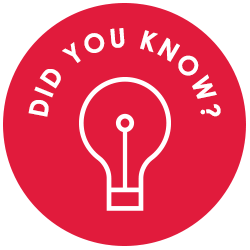 The temperature in the core of a Rolls-Royce Trent 900 jet engine is 2000 degrees Celsius, half the temperature of the sun. Do you have a question? Have a look at our Frequently Asked Questions page.